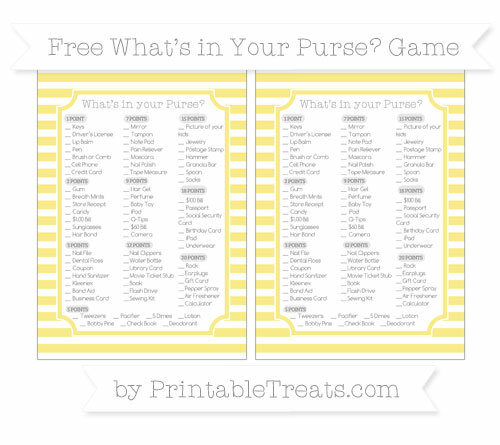 Here’s a fun game for a baby shower, bachelorette party, or other ladies only event – the What’s in your purse? game. This cute set of printable games has a white background and a colorful pattern printed on them. There are two game cards per sheet of paper – just print and cut. To play the game: Give each guest a game card and have them go through their purses, checking off items on the card they find along the way. Each item on the cards are worth certain points. Add up the points and the person with the highest total wins. It’s also fun to see a show of hands for who carries certain funny things in their purse.